ConocoPhillips' Eagle Ford Shale production was 141,000 boe/d in the fourth-quarter of 2013, surpassing fourth quarter 2012 production from the formation by 58%. The Lower 48 and Latin America accounted for ~28% of the company's total production. In the fourth quarter of 2012, Conoco's Eagle Ford production averaged 70,000 boe/d, but grew rapidly in Q4 2012 to 100,000 boe/d. In December of 2013, Conoco announced a five year plan to invest $8 billion in the Eagle Ford and grow production to almost 150,000 boe/d by 2017. 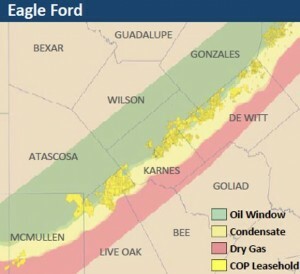 Conoco will likely reach its goal of 150,000 boe/d from the Eagle Ford sometime in 2014 or almost three years earlier than planned. In 2014, Conoco will spend ~$9 billion on its North American operations. Approximately $4.3 billion will be focused on the Bakken, Eagle Ford and Niobrara Shale. In 2013, Conoco's production in the Eagle Ford, Bakken and Permian grew 31% from ~167,000 boe/d in the fourth-quarter of 2012 to ~218,000 boe/d in 2013. The growth in unconventional drilling has contributed greatly to Conoco's reserves. In 2013, Conoco added 470 million boe in Lower 48, primarily in liquids-rich shale plays, including the Eagle Ford and Bakken.